Web Bio : Stephen Knapp grew up in a Christian family, during which time he seriously studied the Bible to understand its teachings. In his late teenage years, however, he sought answers to questions not easily explained in Christian theology. So, he began to search through other religions and philosophies from around the world and started to find the answers for which he was looking. He also studied a variety of occult sciences, ancient mythology, mysticism, yoga, and the spiritual teachings of the East. Finally, after his first reading of the Bhagavad-gita, the classic summary of Vedic philosophy, he felt he had found the last piece of the puzzle he had been putting together through all of his research. This increased his understanding of everything else he had been studying. Therefore, he continued to research all of the major Vedic texts of India to gain a better understanding of the Vedic science, until he became a full-fledged follower and practitioner of Sanatana-dharma. Under the authority of Srila A. C. Bhaktivedanta Swami Prabhupada, Stephen and was given the spiritual name of Sri Nandanandana dasa and became initiated into the spiritual line of the Brahma-Madhava-Gaudiya sampradaya. He has also been to India numerous times, and works with many organizations on lecture tours, and has visited almost every state of the country, and most of the main and many minor holy places of India. 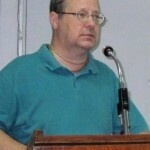 Stephen has so far written 27 books on various aspects of Vedic culture, available through Amazon.com as both paperbacks and Kindle Ebooks, as well as 12 additional Ebooks that answer many questions about Hinduism/Vedic culture that you can find on his website at www.stephen-knapp.com or simply http://stephenknapp.info . Stephen is also the founder of the World Relief Network which helps to spread genuine spiritual knowledge throughout the world, and is also one of the founders and president of the Vedic Friends Association (VFA), a non-profit organization for networking with other serious writers, researchers and teachers who help protect, preserve and expand the knowledge and benefits of Vedic culture, and with students who join to learn more about the Dharmic traditions. More about the VFA can be found at its website at: www.vedicfriends.org. An introduction to Stephen’s many books, articles, research, photography of India, and other projects can be found at his website: www.stephen-knapp.com or http://stephenknapp.info.